There are multiple ways to affect the look of your output. Styles To control the look (and sometimes behavior) of your content, you will use styles associated with Word and Doc-To-Help. Local formatting (changing the look of content directly on the text) is also possible, but not recommended. Styles are better because they let you control the look of content in many places by changing a single style property. There are a few ways to use styles and some important concepts to know when you are working on a Doc-To-Help project. See About Styles. Themes Doc-To-Help uses themes to style the "skin" that surrounds your content in online output, as well as the button display and labels, icons, colors, and so much more. Several pre-defined themes are included for each online target, and it is easy to create a custom theme to meet your needs and preferences. See About Themes. Window Display The Windows dialog controls the position and—depending on the target—the buttons, caption, background color, and other characteristics of output windows. Any window options not specified here will be set using the Theme Designer. See Setting the Window Display. Doc-To-Help relies on your use of Word's heading styles (e.g., Heading 1, Heading 2) in order to break your document up into multiple topics. This is important for online outputs. So you should make sure to apply those styles to headings in your document where you anticipate new online topics should start. Tip: If you plan to implement context-sensitive Help (see About Context-sensitive Help), you should standardize on one (at most two) heading styles that Help button topics will map to. It can be confusing to the user if multiple styles appear from Help buttons. Make sure to structure information so that Help buttons have only one logical mapping. Dialogs that are reused throughout an application can make this challenging. In addition to Word's styles, Doc-To-Help has several special styles that it uses for certain features (e.g., drop-downs, popups, conditions). 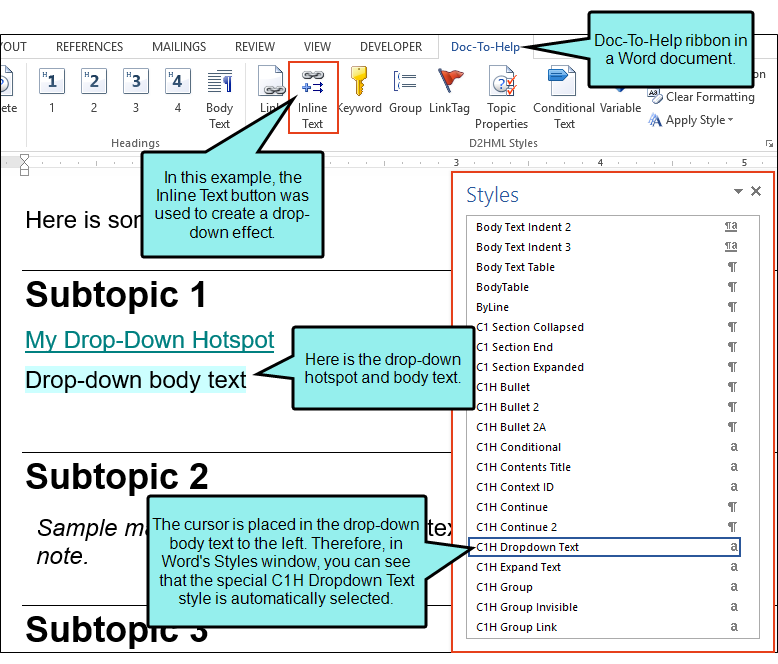 These styles are automatically applied to content when you use features in the Doc-To-Help ribbon in the Word document. Also, you will see these styles (which begin with C1H) when you open the Styles window in Word.